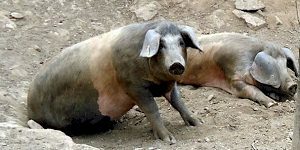 Bisaro pigs are commonly found in Portugal. They are black to an almost white, pink color and have a convex dorsal line. They grow to be up to 95cm in height and weight around 87kg. They were classified by J.F. Macedo Pinto in the nineteenth century as Bizaro Type 1, or Celtic. He believed that they are a variation of Celtic pig from Gaul.